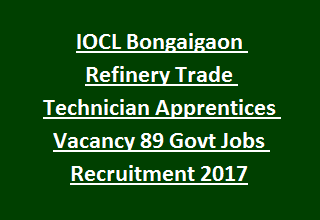 Attendant Operator (Chemical Plant), Trade Apprentices (Fitter, Boiler) at Bongaigaon Refinery, IOCL. There are total Apprentices vacancies available in IOCL Bongaigaon Refinery Recruitment are 89 posts. Interested candidates having desired qualifications may visit the Indian Oil Corporation Limited official website @ www.iocl.com. Open the web link and Search for the desired post. IOCL online Application submission starting date is 28-October-2017. Read the guidelines and fill the necessary fields. Submit the IOCL application before 11th November-2017. After selection candidates will be paid Rs. 2500/- per month plus allowances. Selection of candidates for IOCL Bongaigaon Refinery Apprentices Jobs is based on written test and Interview. Full updates regarding Indian Oil Corporation Limited IOCL Bongaigaon Refinery Trade Apprentices, Technician Apprentices Recruitment Notification dates, Available Vacancies, Eligibility Criteria, Application Procedure, Age limits, Selection process, Pay scale are given below. Total Apprentices vacancies in IOCL Bongaigaon Refinery Recruitment are 89 posts. 1. Trade Apprentices/ Attendant Operator (Chemical Plant): 36 posts. 2. Trade Apprentices- Fitter (Mechanical): 05 posts. 3. Trade Apprentices- Boiler (Mechanical): 10 posts. 4. Technician Apprentices (Chemical): 13 posts. 5. Technician Apprentices (Mechanical): 16 posts. 6. Technician Apprentices (Electrical): 4 posts. 7. Technician Apprentices (Instrumentation): 05 posts. Applicants should have Age limit for IOCL Apprentice Jobs is 18 years to 24 years. Upper Age will be relaxed for reserved category is as per IOCL Govt rules. Pay scale for Trade/Technician Apprentices Jobs is Rs. 2500/- towards Stationery, Conveyance, Miscellaneous and other allowances. Trade Apprentices/ Attendant Operator: Three Years BSc in relevant stream (Physics/ Chemistry/ Mathematics). Technician Apprentices: Three Years Diploma in relevant discipline (Mechanical/ Chemical/ Electrical/ Instrumentation & Control/ Instrumentation/ / Instrumentation & Electronics Engineering). IOCL Recruitment Selection depends on candidate performance in written examination and Interview. See the IOCL notification for more selection process details. Interested individual with desirable qualifications have to go through the Indian Oil Corporation Limited official website @ www.iocl.com to apply for IOCL Apprentices Jobs. Read the clear guidelines available at IOCL advertisement. Online Applications available at IOCL website from 28-October-2017. Last date for submission of IOCL applications through online is 11-November-2017. For more queries please E- mail: bgrrecruit@INDIANOIL.IN, contact: 03664-253112.